(Francisco Kjolseth | The Salt Lake Tribune) People arrive to vote early at the Salt Lake County complex for primary election day on Tuesday, June 26, 2018. If you can, as the old saying goes, blame your problems on incompetence rather than evil, you might live in Utah. Utah County, that is. Candidates and their supporters in Florida, Georgia and Arizona are still attacking one another — and their respective state and county election officials — alleging malice, skulduggery and downright cheating. 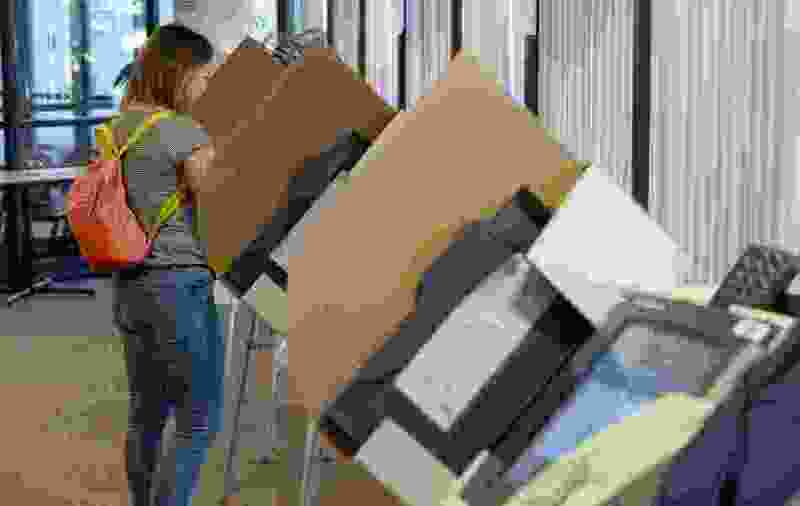 Razor-thin margins in races for governor, U.S. Senate and other positions are tied to voter suppression efforts that range from pre-election purges of voter rolls to shortages of voting and counting machines to reports of whole bundles of ballots going missing and then turning up again. In Utah, the long wait for final election results show no evidence of ballot boxes being stuffed or lost. At least, not deliberately. But the delay kept everyone waiting over one of the closest races on the ballot — the challenge by Democrat Ben McAdams to Republican Rep. Mia Love — as well as the controversial statewide initiatives. Hence the upset, all the way up to the governor, with the slow process in Utah County. Election results throughout the state have been slower for a couple of cycles now that more voting has been done by mail. Ballots postmarked by the legal day-before-Election-Day deadline trickle in but still deserve to be counted. At the same time, county election officials have over-estimated the number of voters who choose to participate though a method that they reasonably thought would be more attractive to more voters, and so fail to ramp up for the number of voters who still prefer to vote on the designated day. Utah County has a history of voting mess-ups. That’s one reason why the person in charge of this election — Clerk-Auditor Bryan Thompson — won’t be in charge of next one, having been voted out in the primary. In fairness, though, running elections in Utah is harder than it used to be. A move toward mail-in ballots and, new this year, a system that allows eligible citizens to register at the polls on election day are good ideas because they encourage more people to vote. But they also result in a system with more moving parts, more opportunities for failure or error. Or just more days necessary to count all the votes. After the dust from the 2018 election has settled, Utah needs an overall review of the process, in every county, by the state election office. Not a hostile investigation, just a cooperative report on what works, what doesn’t, what county clerks, poll workers and voters need to have explained to them so everyone can do their part. “You had one job,” might be a fair criticism of the failure of a system that has nothing else to do, with state and federal elections in even-number years and municipal elections in the odd, and still doesn’t meet our expectations. But it is also true that a football team that only played one real game a year might not be at its sharpest at kickoff. Elections are the heart of democracy. That means that, like democracy, they can be a little messy. But ours should run better than this.